MASTER BATHROOM BEFORE & AFTER PHOTOS OF LARGE NAPERVILLE MASTER BATHROOM REMODEL. LOOKING FOR A CONTRACTOR NEAR YOU? 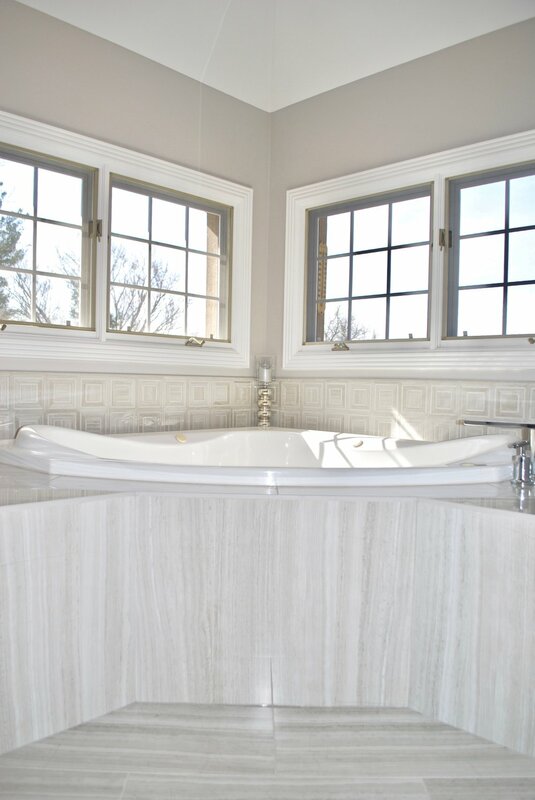 LOOKING TO REMODEL YOUR BATHROOM BUT KEEP YOUR EXISTING TUB? SOUTHAMPTON IS EXPERIENCED IN ALL LEVELS OF BATHROOM UPDATING. LOOKING FOR A TRUSTWORTHY GENERAL CONTRACTOR NEAR YOU? 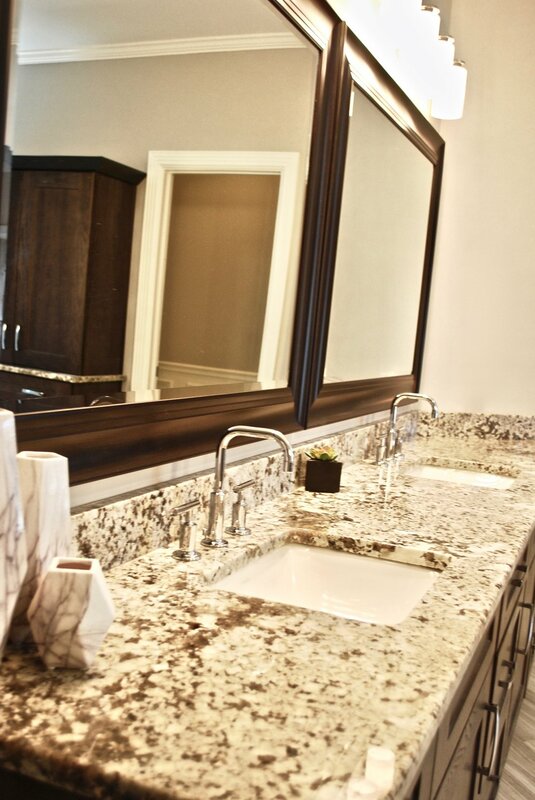 LOOKING FOR A GENERAL CONTRACTOR FOR YOUR BATHROOM REMODELING PROJECT IN NAPERVILLE IL? CALL SOUTHAMPTON BUILDERS! TIRED OF YOUR 12X12 HOME DEPOT MARBLE TILES IN YOUR MASTER BATHROOM? ARE THEY BREAKING UP AND THE SUB FLOOR IS LOOSE? 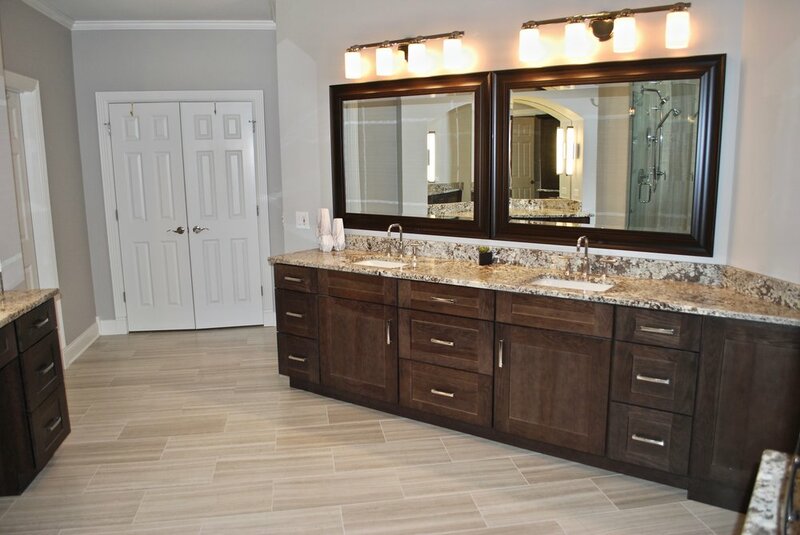 CALL SOUTHAMPTON BUILDERS TO REPLACE AND REMODEL YOUR MASTER BATHROOM! NAPERVILLE IL. 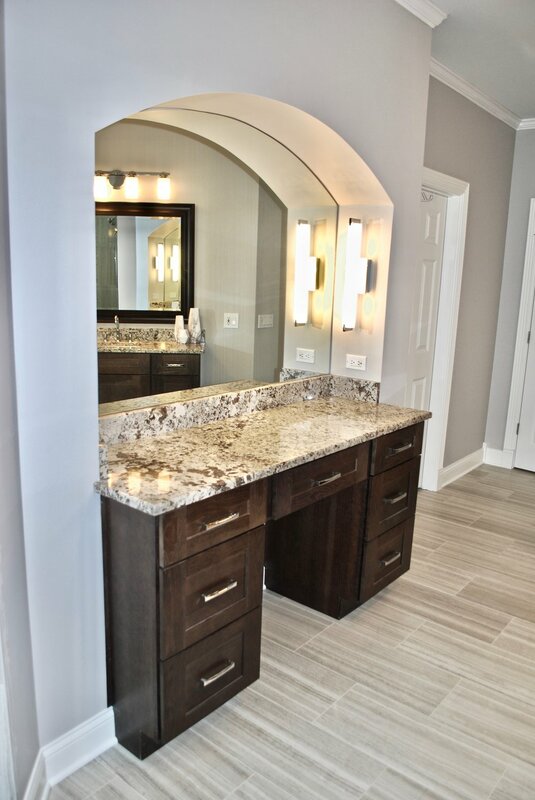 BATHROOM REMODEL WITH COFFEE STATION AND NEW DOUBLE BOWL VANITY WITH CUSTOM CABINETRY AND NEW GRANITE COUNTERS. NAPERVILLE BATHROOM REMODEL. RENOVATIONS. UPDATING & REPLACEMENT. NEW SHOWERS & TUB DECK RENOVATIONS. 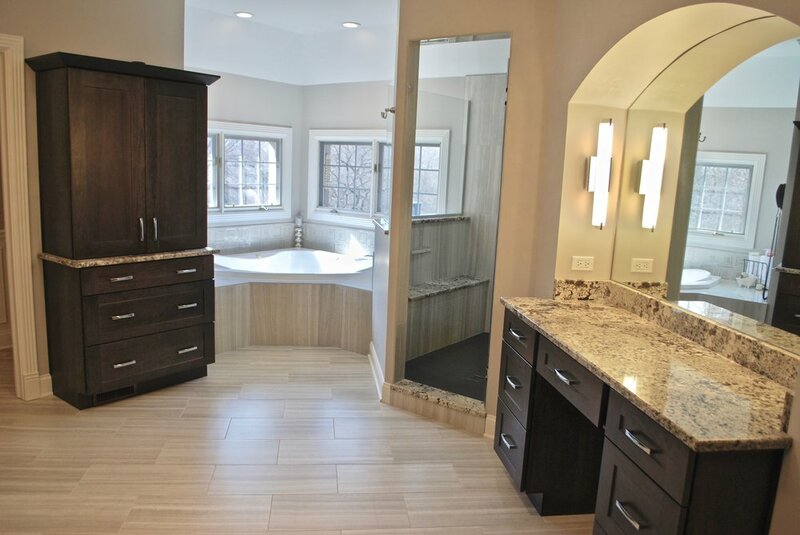 LOOKING TO REMODEL YOUR NAPERVILLE IL CUSTOM MASTER BATHROOM? CALL SOUTHAMPTON AND START THE RENOVATIONS TODAY! NEW GRANITE COUNTERTOPS IN NAPERVILLE IL. BATHROOM & KITCHEN GRANITE COUNTERS. 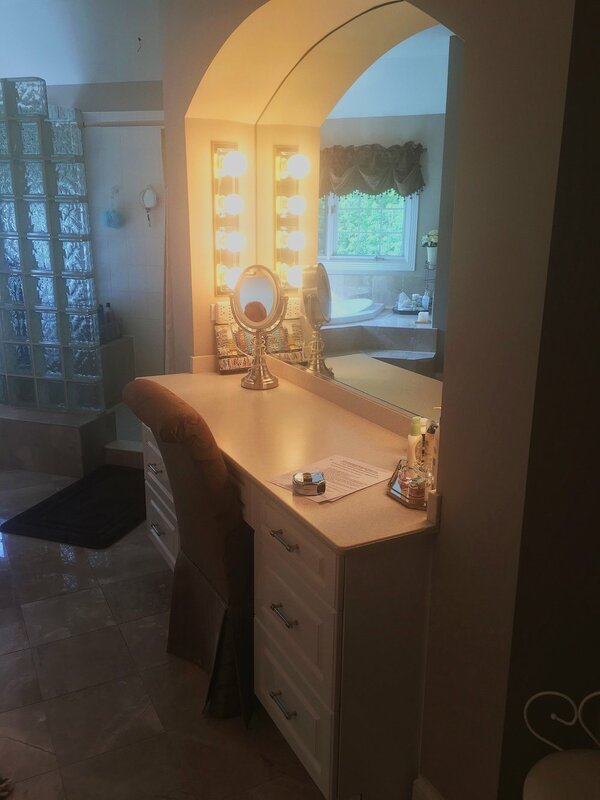 NAPERVILLE MASTER BATHROOM REMODEL WITH LARGE DOUBLE BOWL VANITY AND MAKE UP AREA - EXPANDED SHOWER AND REMODELED TUB DECK. THIS FUN BATHROOM REMODEL IN NAPERVILLE IL. FEATURES A LARGER SHOWER WITH A REMOVED GLASS BLOCK WALL. THE NEW SHOWER PROVIDES MULTIPLE NICHES FOR SHAMPOO, A LARGE BENCH, HAND HELD SHOWER & A SQUARE DRAIN FOR ATTRACTIVENESS. THE NEW FLOOR IS A 12X24 PORCELAIN TILE MADE TO LOOK LIKE A GREY MARBLE. THE EXISTING 12X12 MARBLE FLOOR WAS POPPING AND CHIPPING. THERE WERE MULTIPLE FIXES BUT THE SUB FLOOR WAS FAILING AND HAD TO BE REPLACED. THE NEW TILE ALSO PROVIDED A TRANSITIONAL BASE FOR THE NEW DESIGN. WE ADDED CHAIR RAIL & BOXES IN THE TOILET ROOM AND PAINTED THE WAINSCOTING TRIM WHITE. WE ALSO UPGRADED THE TRIM IIN THE BATHROOM FROM SMALL TO EXTRA LARGE. THE ADDED COFFEE STATION IS GREAT TOWEL STORAGE AND FILLED A UNUSED SPACE. 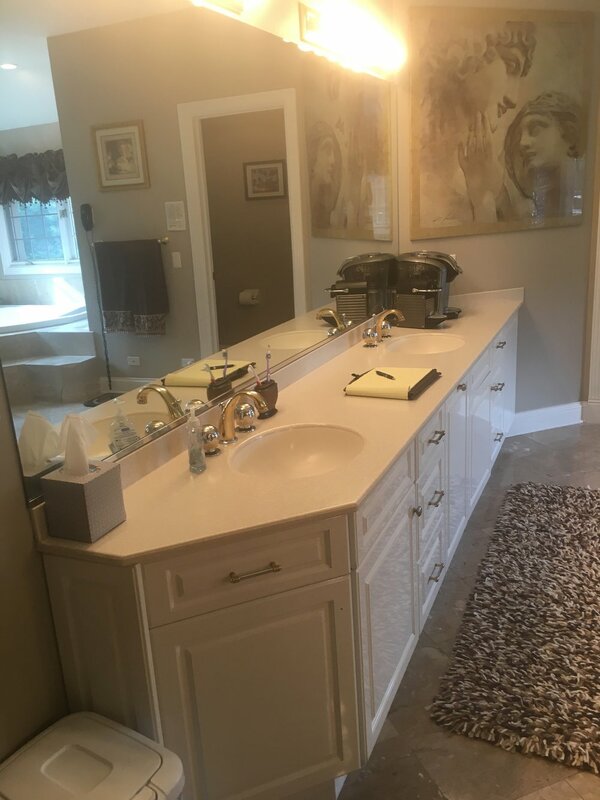 BATHROOM RENOVATIONS & UPDATING IN NAPERVILLE IL. REMODELING BATHROOMS & KITCHENS FOR OVER 30 YEARS. SOUTHAMPTON IS A GENERAL CONTRACTOR WITH CUSTOM HOME EXPERIENCE AND AN AFFORDABLE REMODELING PROFESSIONAL. WE SERVICE NORTHERN ILLINOIS AND ARE LOCATED IN THE FOX VALLEY TOWN OF GENEVA IL.